Every day, Watch This offers staff recommendations inspired by a new movie coming out that week. This week: The Skeleton Twins, featuring serious turns from former SNL costars Kristen Wiig and Bill Hader, has us thinking about other dramatic departures from comedic actors. 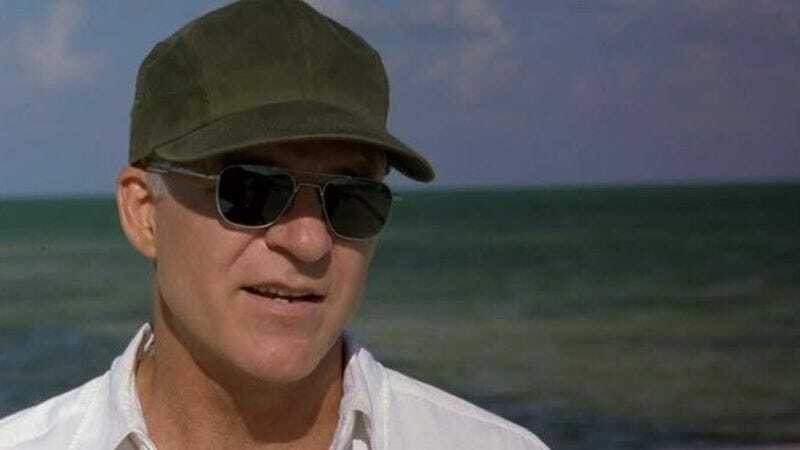 By 1998, Steve Martin’s on-screen persona had mellowed considerably from his wild and crazy early years, but he still appeared almost exclusively in comedies and the occasional dramedy. He’s more or less continued with that game plan in the years since, which makes his work in David Mamet’s The Spanish Prisoner all the more special. As Jimmy Dell, a man who Joe Ross (Campbell Scott) meets while on a business trip in the Caribbean, Martin makes use of the opacity he’s cultivated off screen. Jimmy appears friendly, except when he brusquely rebuffs his new friend for no reason Joe can see; he appears no-nonsense and forthright, except when he’s changing plans abruptly; and he lives a wealthy life that Joe only glimpses. Jimmy’s lifestyle functions as a promise of sorts for Joe, who has invented something referred to only as “the process” that will make the company that employs him very rich and allow it to “control the global market.” These words and phrases are repeated constantly in the movie’s opening section, and while the dialogue is less profane than Mamet’s most famous works (in fact, it isn’t profane at all), the staccato repetition that elides actual concrete details is pure Mametese. As Joe worries about whether he’ll get his fair share of the company’s profits and his odd friendship with Jimmy progresses, Mamet elides details visually, too—from the way the camera pulls away from a blackboard displaying Joe’s estimate of “process” profitability to the way a glare of light obscures a photo of an important unseen character. Both the story and the style of The Spanish Prisoner indulge Mamet’s obsession with sleights of hand and con artistry. This strategy means Martin has to slip in and out of the picture, but when he’s on-screen, reading Mamet lines with a dry wit, Jimmy Dell becomes the sophisticated, generous rich friend out of a young go-getter’s dreams. It helps that Scott, playing something of a milquetoast dupe, makes Martin look smoother and more suave by comparison. Joe furrows his brow, adjusts his glasses, and tries to keep up with all of the potential deception around him. (At one point, Mamet seems to be making fun of him, having a background character repeat an obvious cue for a plot twist over and over, Joe seemingly taking minutes on end to make the connection). He’s the only major character in the movie who doesn’t offer ironic self-description, like Jimmy’s admission that “I’m a problem-solver and I have a heart of gold,” or Joe’s coworker Susan (Rebecca Pidgeon) calling herself “loyal and true and not too hard to look at.” Joe’s motivations, though, are never in doubt. This being a Mamet movie, it’s the people advertising their straightforwardness who need to be watched. Availability: The Spanish Prisoner is available on DVD, which can be obtained through Netflix or your local video store. It’s also available to rent or purchase through the major digital services.